Art supplies are on-hand for making cards, at SurveyGizmo. Used with permission from SurveyGizmo. Today, we want to talk about love at work. Let’s be clear: we’re not talking about office romance. What we are talking about is love as expressed through gratitude, appreciation, friendship, and support. The kind of love that has lasting power and can deliver energy to your organization. Army Colonel Joe Ricciardi grew interested in the idea of love at work almost 10 years ago, when he was training to lead 2000 soldiers to clear the roads of Improvised Explosive Devices (IEDs) in Afghanistan. As he prepared for deployment, a general shared one piece of advice: “just love your soldiers.” Ricciardi took that advice to heart, shared it with his soldiers in the field, and later returned home to earn his Ph.D. in values-driven leadership. #1: Intimacy: knowing and caring about the personal lives of your team members in an authentic and appropriate way. #2: Passion: the positive energy you bring to your work, and to your organization’s mission and values. #3: Commitment: a dedication to the well-being of others and to the shared task. Valentine’s Day can be a convenient excuse to playfully express appropriate intimacy, passion, and commitment. 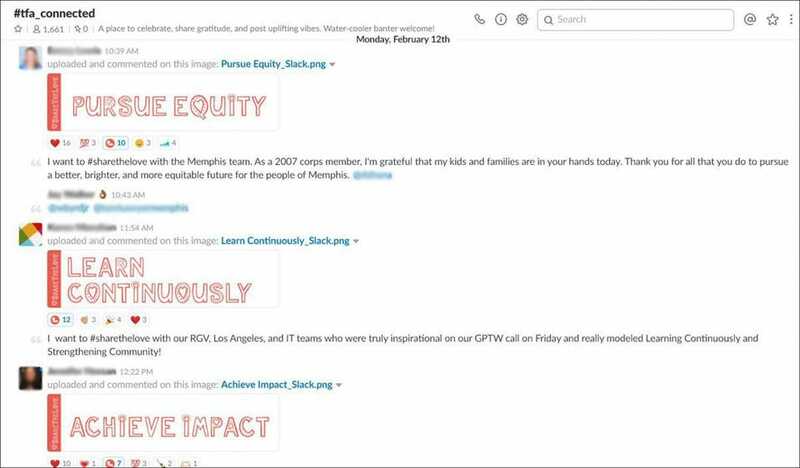 All this week, employees at national non-profit Teach for America are using the hashtag #ShareTheLove on an internal Slack channel to publicly celebrate team members’ commitment to the organization’s core values. Public celebration that highlights core values is a great way to share the love.PHOTO PROVIDED BY TEACH FOR AMERICA WITH PERMISSION. Employee’s at SurveyGizmo have a Valentine’s station set up in the office, so they can craft a message of appreciation for a colleague. “It builds community in the workplace and reminds us that there is time for fun at work,” says Lucie Tran, an Enterprise Project Manager at SurveyGizmo. (SurveyGizmo is a Forbes Small Giant Company). Tran’s hypothesis is supported by research from Barbara Frederickson of University of North Carolina. Frederickson found that positive emotions like joy and happiness can spark creativity and innovation, which can have a real impact on working relationships and workplace results. Of course, showing love isn’t reserved for employees, and it doesn’t have to be reserved just for Valentine’s Day either. After being overwhelmed with vendor gifts during the winter holiday season, digital marketing agency BeFoundOnline realized they needed to take a different approach to stand out with their clients. This year, they surprised some clients and vendors with a custom video and a pancake breakfast on Groundhog’s Day. “We realized we needed to say thank you at a different time than the rest of the world,” says Dan Golden, president. As anyone in a lasting relationship can tell you, love cannot be reserved for one day a year. Showing real intimacy, passion, and commitment toward employees takes more than a box of chocolates. It also cannot be faked or self-serving. Authentic love for your teammates starts with knowing each other personally. The most compelling example of this we’ve encountered comes from data center hardware maintenance company Service Express, where leaders are committed to the personal, professional, and financial goals of employees. What does that look like in real life? One example: your leader rearranges your schedule so you can make every one of your son’s Friday afternoon football games. See more examples in this video. Use this Valentine’s Day to share the love with your team members, and more importantly, to launch a year-round campaign of (appropriate) intimacy, action, and commitment toward one another. EDITOR’S NOTE: This article was originally published in our Forbes.com column, which can be found at this link.